The following are random thoughts that came to me just before I went to sleep. I grabbed some paper and a pencil and jotted them down. When I looked at them in the morning it seemed like there was a disconnect between the two strings of thought. However, I have been mulling this over for a while and I think there is a connection. Tell me what you think. How many times have we made up our mind about a person or a situation before we bothered to find out anything more than meets the eye? 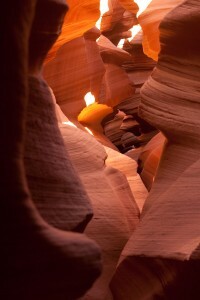 When I went to Page, Arizona to visit the Antelope Slot Canyon I only had a vague idea what to expect. I don’t do much research before I visit a place, I like to be surprised. When I arrived at the entrance to the canyon, I thought our guide was pulling my leg. 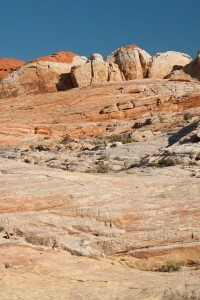 I didn’t see anything but brown sandstone stretched out in front of me. 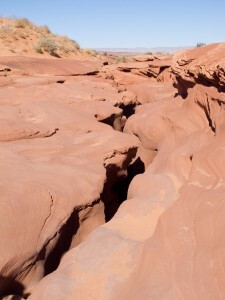 There was only a two foot wide crack the length of the sandstone, very unassuming. If it would not have been for the guide I might have walked away and missed out on one of the most extraordinary natural wonders. The desert around my neighborhood here in Nevada appears flat with mountains in the distance. Only when you get out of the car and walk into the desert will you discover the washes, hidden canyons and crevices in all their splendor. A couple of posts back I told you about my last mountain climb. Looking at that mountain from afar it seemed impossible to climb (without robes) until you get closer finding little steps in the rock and taking one step at a time to the top. It can also go the other way, a climb that starts out as an easy walk down a wash ends abruptly at a steep drop off. We all have been there when we were faced with a seemingly insurmountable task. Be it the garage we have been meaning to clean out for years or a complex set of architectural drawings. Where to start? One of the things I earned in woodworking, and then again was reminded of during my journey, is that you need to break things down to make them more digestible and less overwhelming. Focusing on just one small section of the garage at the time and not the whole thing makes the task less daunting. A teacher of mine once said that consistency and continuity make accomplishing a task almost effortless; e.g. it is easier to take care of chores a little at a time every day instead of trying to get everything done all at once. Coming to these insights is one thing, applying them is a whole other story. If you would have asked my opinion about people who live in mobile home parks and in trailers a year ago I would have told you something very different than today. My opinions from a year ago have not completely changes, but they have expanded. Humans and nature deserve a closer look. You can miss out on meeting great people or seeing beautiful places if you pass judgment without knowing the details. Step closer and take a second look you might be surprised at what you find. Humans are complex creatures and we don’t all fit into one mold.